Karpenissi. Karpenissi is the capital of the prefecture of Evritania and lies at the foot of Mount Timfristos, at an altitude of 960 m. Karpenissi got its name probably due to the maple trees that are common in the area. (Karpen = maple, Karpenis = land of the maple trees). The clean atmosphere, the dry healthy climate, the planes, the chestnut and pine forests make Karpenissi an ideal summer and winter resort. Among the most characteristic features of the city are the workshops that produce handmade brass bells for animals. The ringing of the bells being tested will provide you a charming welcome. 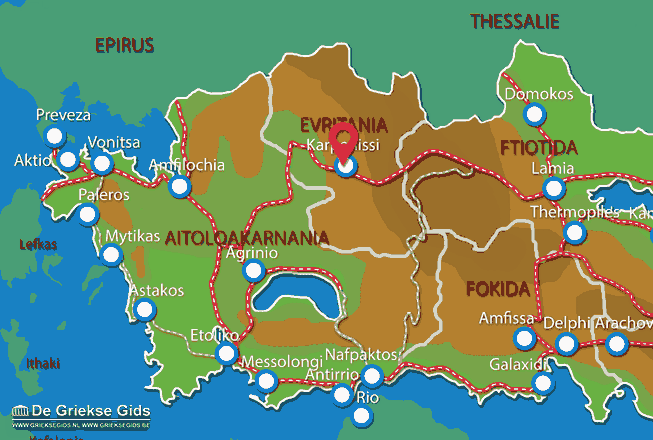 If you are going to eat at a tavern in Karpenissi, try the local roasted feta cheese and sausages, and before you leave, buy some goat butter, and cheese, chestnuts and walnuts.